Hello Happy Valentine’s Day @ The Cheesecake Factory! My friends and I love The Cheesecake Factory! As many of my blog readers may have noticed, I’ve spent many special occasions with friends here. Although, I’ve been here several times, I still get quite overwhelmed with their 26 page menu! 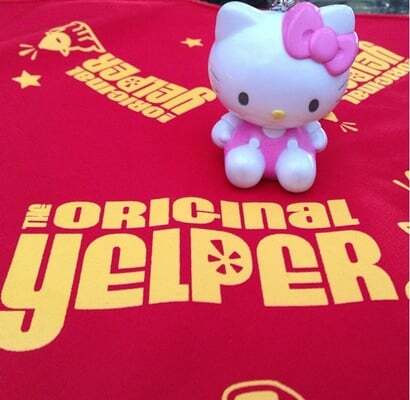 Luckily whenever I go here with friends, I have the chance to try several of their savory and sweet eats. For today’s blog post, I’ll share little tidbits of some of those items. From the small plates and appetizers menu, one of my friends got the Chicken and Mushroom Lettuce Wraps. I’ve always been a fan of lettuce wraps and I was quite curious to see how this dish would be at The Cheesecake Factory. Six pieces of crisp butter lettuce leaves was accompanied with a nice mix of diced chicken, mushrooms, green onion, ginger and garlic. 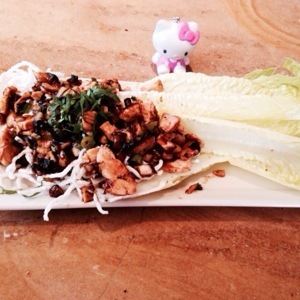 I liked that they used shiitake mushrooms for their lettuce wraps. 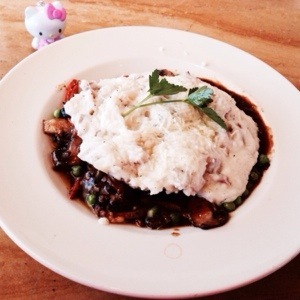 Shiitake mushrooms tend to give a more rich, hearty flavor to dishes and this is exactly what it did for this plate. There was a little bit too much oyster sauce on this dish though but it still made for a good appetizer/ entree. It was also nice to see that these lettuce wraps are part of The Cheesecake Factory’s skinnylicious menu for items less than 490 calories. One of the other items that my friends and I got to try today was their Crusted Chicken Romano dish. This dish has chicken breast coated with romano-parmesan cheese crust. It is paired with pasta topped with tomato sauce. 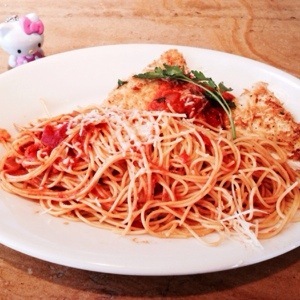 The cheesy pieces of chicken and the long, angel hair noodles made for a nice pair! The noodles were soft and the chicken had good golden brown crisp. The tomato sauce on the pasta was perfectly light and not overwhelming. Although, I loved the various savory entrees, I made sure to make room for the sweet treats at the end. 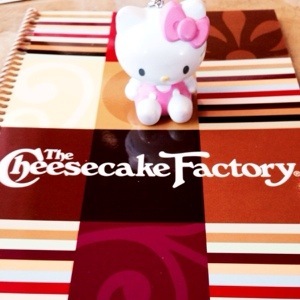 This is The Cheesecake Factory after all and is one of the sweetest days of the year 😉 and so cheesecake was a must. We definitely had a lot of cheesecake love for this dinner! The first cheesecake we tried was Adam’s Peanut Butter Cup Fudge Ripple. Honestly, I feel like we should have saved this for last because this was the most intense of all the cheesecakes we tried. 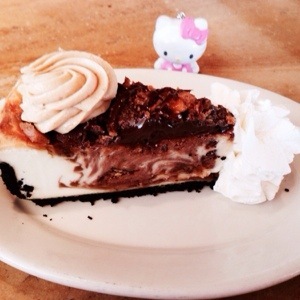 This cheesecake had swirls of caramel, peanut butter, butterfinger and Reese’s Peanut Butter. The sweet caramel comes out at first bite and then next up is the rich flavors of peanut butter and butterfinger. This one had a very bold sweet kick to it. I really liked our second cheesecake! 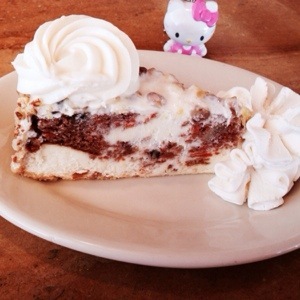 We got the Craig’s Crazy Carrot Cake Cheesecake. It is carrot cake and cheesecake swirled together, topped with cream cheese icing and roasted almonds. It’s a combo of two of my favorite desserts, carrot cake and cheesecake and so it is not surprising that I would enjoy this. The carrot cake was soft and moist and the cheesecake was super creamy. I also liked the touch of almonds in the cream cheese icing. 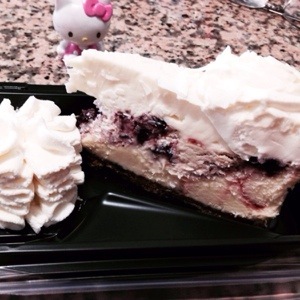 Cheesecake love continued with the Wild Blueberry White Chocolate Cheesecake. This one is the original cheesecake with wild blueberries. It is topped with white chocolate mousse. The original cheesecake had a nice smooth texture and the blueberries added good tart touch. Very simple but classically tasty. 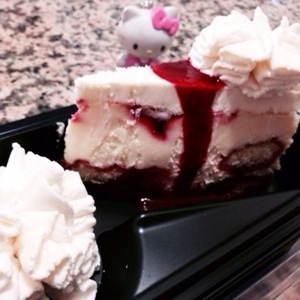 Last but not least for our cheesecake love sweet treats was the Lemon Raspberry Cream Cheesecake. This one consisted of raspberry vanilla cake, creamy lemon cheesecake, raspberry lady fingers and lemon mousse. I really liked the luscious lemon flavor and the slight hint of raspberry. It was from this cheesecake that I realized that my preference for cheesecakes are the fruity based ones versus the chocolate types. Hello Post Valentine’s Day Celebration @ California Pizza Kitchen!